Only a quarter of Americans say they're certain they could come up with $2,000 in a pinch for an emergency. 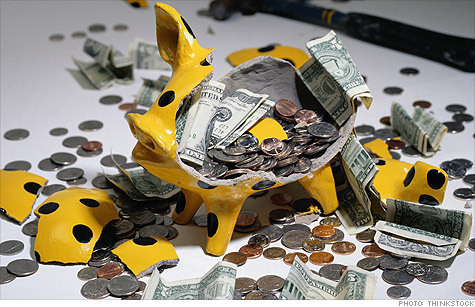 NEW YORK (CNNMoney) -- Half of Americans say they aren't prepared for a minor financial emergency. A new study by the National Bureau of Economic Research shows 50% of Americans would struggle to come up with $2,000 in a pinch, for example in the event of an unanticipated car or home repair, a large medical bill or legal expenses. Everybody has messed up at some point. These folks share their biggest goofs, but are now on the right path. Roughly 28% said they "certainly" would not be able to cope with an unexpected $2,000 bill if they had to come up with the money in 30 days, and another 22% said they "probably" would not be to able to cope. Only a quarter of Americans said they are certain they would be able to come up with the funds. A majority of the 1,900 Americans surveyed said they would have to rely on more than one method to come up with the emergency funds. While 60% said they would dip into savings, 34.2% said they would have to ask family and friends for help and 29.5% said they would have to resort to credit cards, a home equity line of credit, reverse mortgage or unsecured loan. The National Bureau of Economic Research also surveyed seven other countries including the United Kingdom, France, Germany, Canada, Italy, Portugal and the Netherlands. Of those, people in the Netherlands were the most optimistic, with 57.7% of their respondents saying they were "certain" they could handle a $2,000 emergency.